Seahawks.NET - The Voice of the 12th Man! • View topic - Injury Reports & Inactive List for Chargers game. 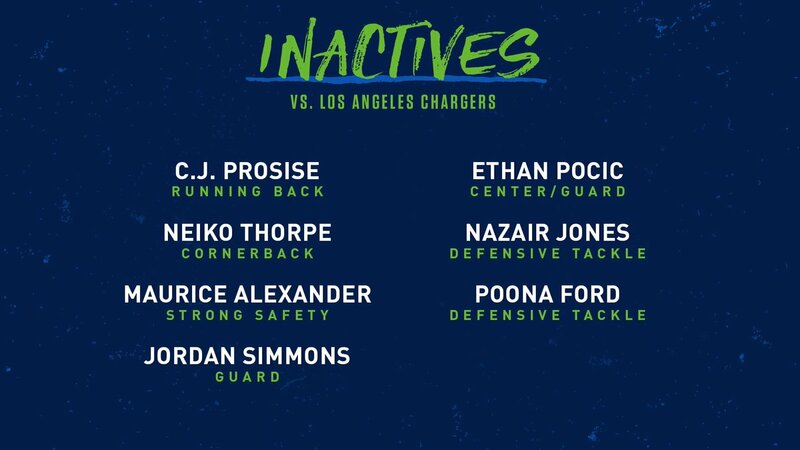 Injury Reports & Inactive List for Chargers game. Last edited by Jville on Sun Nov 04, 2018 11:50 am, edited 1 time in total. Re: Injury Reports for Chargers game. The team is not doing bad, all things considered. Inactives report due out shortly. Two inactive tackles suggests they are expecting lots of quick passing from the Chargers. If so, the pass rush should feature a tag team rotation. Re: Injury Reports & Inactive List for Chargers game. What is the deal with Naz Jones this year? I was expecting a lot from him this year. Has he even been active for a game? oldhawkfan wrote: What is the deal with Naz Jones this year? I was expecting a lot from him this year. Has he even been active for a game? He has been in Pete's doghouse since the pre-season. I was expecting Naz Jones to take a step forward this year as well. I'm just guessing ...... but, I get the feeling that the resurgence of Quinton Jefferson displaced him to a large degree. Also, the addition of Shamar Stephen displaced him on the inside. Although, it's hard to surmise why Naz faded from participation from my very limited vantage point. I've appreciated the improved discipline the defensive line has played with this year.